Being Frugal and Making It Work: Fitness Test Friday: Moving Forward! It's Fitness Test Friday! Three weeks ago, I decided to complete the fitness test program on my treadmill every Friday with the goal to improve just a little each week. I wasn't expecting to see tremendous changes each week, but a little bit of improvement would mean success to me. One workout at a time... slow and steady wins the race! Last night as I was putting the kids to bed I glanced towards my treadmill and saw something that made me laugh out loud. My daughter had been playing behind the couch and decided to give one of her WWE wrestling superstars a workout. She laid out a foam runway on my treadmill that lead down to the wrestling cage! I'm going to complete the fitness test every Friday with the goal of making it just a little bit farther each time. Next week I'm pushing for 1.5 miles! I was selected to participate in the #SmoothBlogger Program and received a treadmill in exchange for my participation. Regardless, I only recommend products or services I use personally and/or believe will be a good fit for my readers. The views and opinions expressed on this blog are purely my own. Results may vary. No monetary compensation was received. You are doing so great! 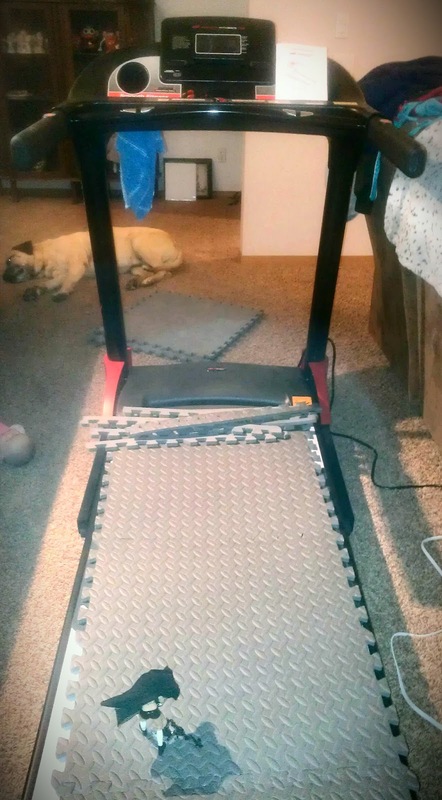 I'm so lazy on my elliptical. I go a mile in about 25 minutes, but figure its better than not moving at all. Awesome! If I only had a treadmill, I would be on it now to keep moving! Keep it up, from what I have heard it takes about 3 weeks to make something a habit but it can all be lost in an instant. Your almost to the 5K mark, sign up for a race in the coming months, it will keep you motivated! Way to keep moving and getting more distance in! Progress indeed, keep it up! Great!!! Oh wow, you are doing GREAT with your time! I am a bit slow but working my way up. I love your fitness challenge and I am inspired. Keep it up! Slow and steady wins the race. You're doing great! What motivates me? Tight clothes. When my clothes start to feel tight...it's time to step it up!